Happy New Year, my friends!! Wishing all my readers, my friends and family all the best for 2015, may it be the best one yet for you all. I’m not sure if anyone is really even reading this, this morning! I’m sure you all had quite a busy night celebrating into the wee hours. Not us, though and by us, I mean us, the two old fogeys. Even Laith had plans with his friend and he’s just 9! We went out for some Thai food with one of the daughters but even she abandoned us after scoring a free dinner from her parents. So, the two of us chilled, the telly quietly humming in the background, broadcasting the New Year’s Eve celebrations in other cities and as I sat typing up my post and editing photos, Trace spent time conquering the world on the computer. This is the extent of our NYE festivities these days, far from the crazy parties of our younger years. I know that it’s really just another day and all, but it still makes you reflect on the past year and the year ahead. Time is just flying by and I see my children growing up. I think that’s the hardest, every year they get older, smarter, and more independent. I can’t come to terms with the fact that my youngest, Laith, will be 10 this year. I remember bringing the ruddy cheeked baby home from the hospital and it seems like yesterday. But, I suppose, the pendulum of life and time swings on without signs of slowing. Like most of my past New Year posts, todays post is a sweet one. Indian customs and many Eastern customs, celebrate happy days and holidays with something sweet. I’m not a believer in posting colonic detox smoothies or diet recipes. I don’t believe in diets either (says the person who seriously needs to go on one). 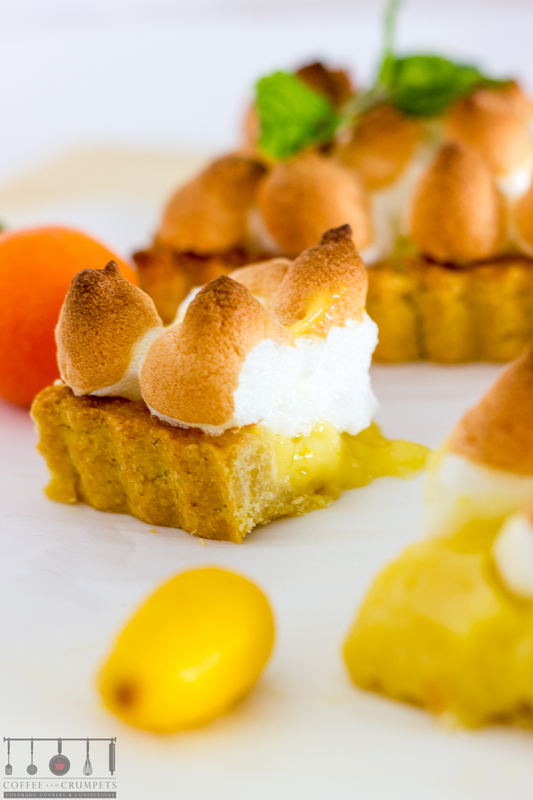 So, in the spirit of a sweet New Year, here’s a Yuzu Meringue Tart, to kick of 2015. Before I delve into the specifics and fun facts about this tart, let me tell you how excited I was to find yuzu at my local Whole Foods. I have never seen them before and had heard that they were hard to come by in the US. So, to walk in and find them while doing my weekly shopping was excitement that only other foodies or bloggers can understand. I bought a sack full and left the store with a million ideas running through my mind. For those not familiar with yuzu, it’s a citrus fruit originating in East Asia (China, where it grows wild). It’s a hybrid and tastes very much like a sour tangerine/mandarin. It’s incredibly fragrant and the zest was so flavourful and full of aromatic oils. It’s bit rough looking in appearance, being a but knobbly and uneven with huge seeds inside. 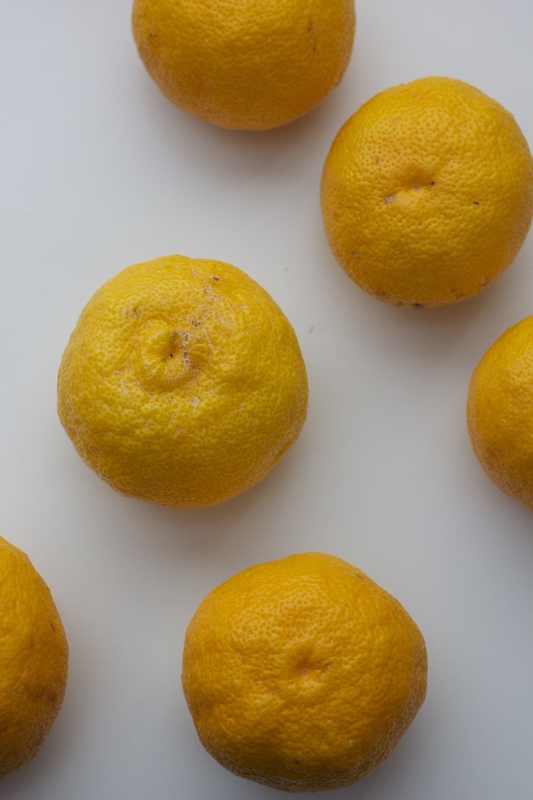 Yuzu fruit is rarely eaten as a fruit because it’s quite sour but is used in cooking, sauces and drinks. If you want to read more about yuzu, here’s the article from Wikipedia. The meringue tart/pie has been on my to do list forever. Many moons ago when my parents owned the restaurant in Houston, we used to carry a lemon meringue pie, which looked amazing, all puffy and white with its golden kisses on top. We never had this pie in London, so it was also very new to me. Unfortunately, I couldn’t try this pie because it was made with gelatine (pork based). I therefore, refrained from all meringue pies everywhere with the fear of them containing gelatine. Of course, once I began making my own pies and cakes, I realised I could make this without gelatine. It’s taken me this long to actually do it. 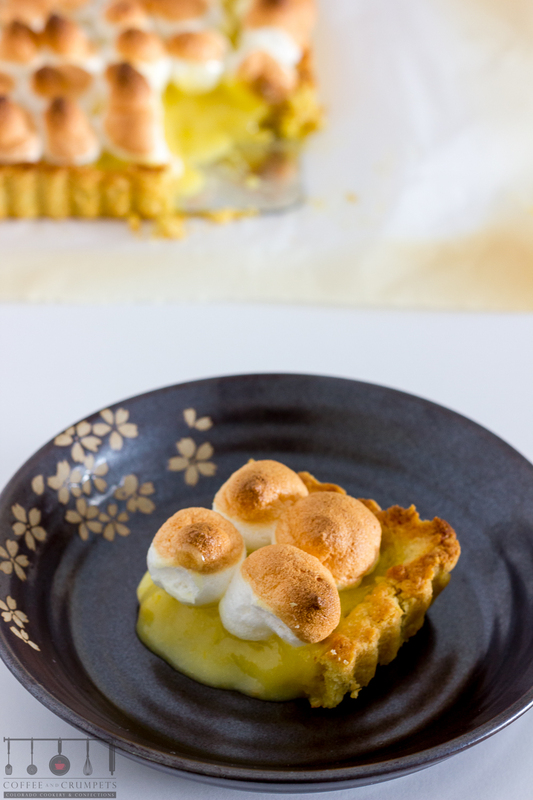 The recipe is pretty much a basic lemon meringue recipe where I subbed the lemon for yuzu. I used Alton Brown’s recipe but I made my own pastry crust and changed some quantities to suit the yuzu fruit. If you notice, my tart crust looks a lot more golden than usual and that’s because of the flour I used. I’ve been experimenting with a non hybridised form of wheat known as Einkorn. The Einkorn flour tends to bake up a lot more golden. I used Einkorn flour here but you’re welcome to use regular flour. And if you can’t find yuzu fruit, make it into a lemon meringue tart, it’ll still be fabulous! 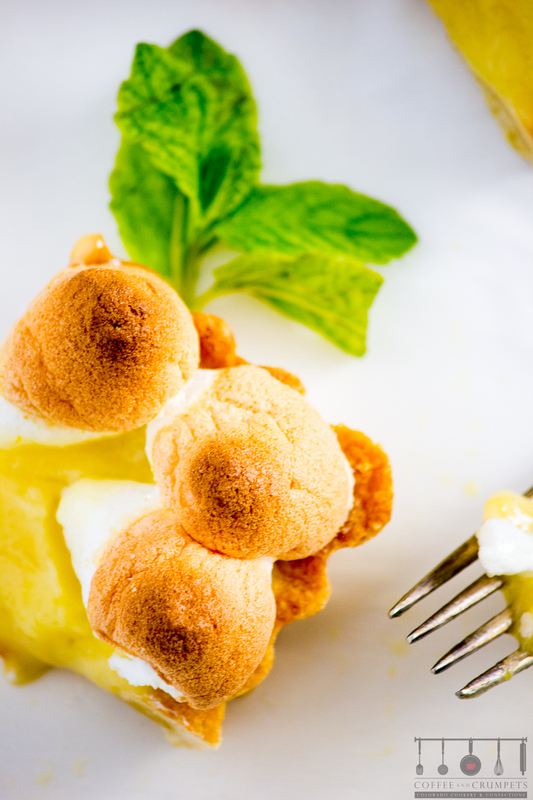 A buttery and crisp pastry crust filled with luscious yuzu custard topped with fluffy meringue. In a food processor, add the flour, sugar and salt and pulse to combine. Add the cubed butter and pulse to break down the butter to pea size pieces. Add the yolk and 3 tablespoons water. Pulse to combine and form a dough. Add more water if needed for the dough to stick together when pressed between two fingers. Dump the flour mixture onto a clean counter and bring the pastry into a ball. Knead just enough to get the dough together. Shape into a circular disc if using a round pie dish or tart pan. I shaped mine into a rectangle. This will make enough dough for a 9"/24cm pie dish, or rectangle tart tin. Cover with plastic wrap and chill in the fridge for atlas 20 minutes. Roll out the chilled dough, into a 12" circle for a round pie dish or into a rectangle for a rectangle tart pan. Once rolled and place into tart shell, allow the tart shell to chill or freeze overnight. To prebake the tart shell. preheat the oven to 425F/200C. Put a piece of parchment paper on top of chilled pie shell and pour in pie weights, beans or rice to blind bake. Remove the shell from the oven and carefully remove the beans/rice/weights. Prick lightly with a fork all over. Place back in the oven for another 10-15 minutes, until golden brown. Take out of the oven and allow to cool a little. Use in the recipe as directed. Reduce oven temp to 375F. Place egg whites and cream of tartar in the bowl of a stand mixer fitted with the whisk attachment. Beat egg whites until soft peaks form. Gradually add sugar and continue beating until stiff peaks form, approximately 1 to 2 minutes. In a medium saucepan, combine cornstarch, water, sugar, and salt. Whisk to combine. Turn heat on medium and, stirring frequently, bring mixture to a boil. Remove from heat and gradually, add hot mixture to egg yolks and whisk to temper the mixture. Return egg mixture to saucepan, turn heat down to low and cook, stirring constantly, for another minute. Remove from heat and gently stir in butter, lemon juice, and zest until well combined. Pour mixture into tart shell and top with meringue while filling is still hot. Make sure meringue completely covers filling and that it goes right up to the edge of the crust. You can just spoon on the meringue or use a pastry bag, like I did, and drop little dollops. Either way tastes good, it's just aesthetics. 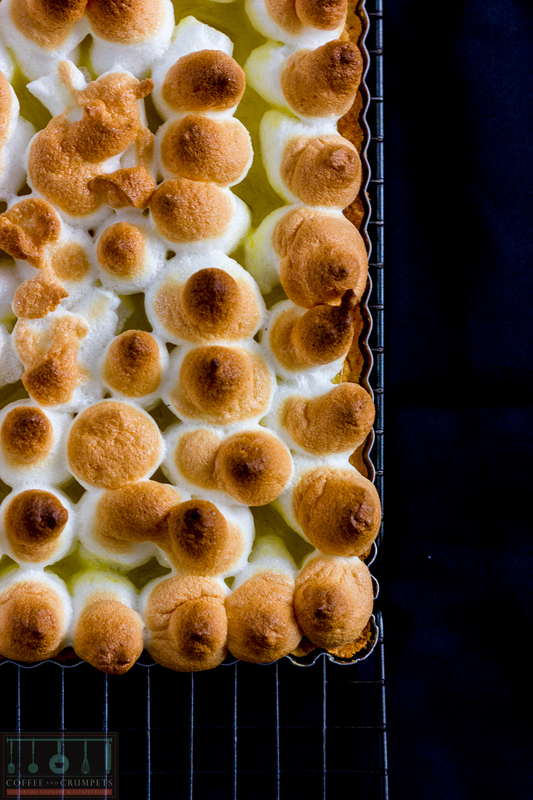 Bake for 10 to 12 minutes or until meringue is golden. Make sure pie is cooled completely before slicing because the meringue will ooze everywhere if you don't!! A yuzu does not yield much juice so I added some orange juice. The yuzu zest will more than over power the orange juice and the taste will be totally yuzu. If you're making a lemon meringue, please increase the sugar to 1⅓ cups of sugar. The yuzu orange juice doesn't need as much sugar. High altitude bakers, don't whisk your meringue to stiff peaks. As soon as they can hold a fairly stiff peak, stop beating. Over beating meringues can flop our meringues here in the high altitudes. The yuzu tart has a lovely sweet tart flavour and tastes very much like a sour tangerine. I love citrus fruit so this was a treat for me. It was very addictive and I single handedly ate half of the tart. Hope you can find some yuzu to try this fruit in a great tart. The filling was incredibly fragrant and full of flavour making the whole tart just delicious. Hello, my friend, Nazneen! Sorry I have been MIA in the blog world for quite some time. So many things happening all at once. But anyway, happy new year! Hope 2015 bring lots of good things! Love the new look of your blog. Last time I visited, it looked a bit different! P.S, Love yuzu! So expensive to get here in Canada, though. So finally got around to posting the recipe.. Looks phenomenal. How do you like the Einkorn flour? It is a go to flour in my pantry and the only one I can eat without problems. That color! That crust! So beautiful! What a lovely, bright vibrant recipe to start the year with. I just got a kitchen blow torch and now I can try to make something like this. 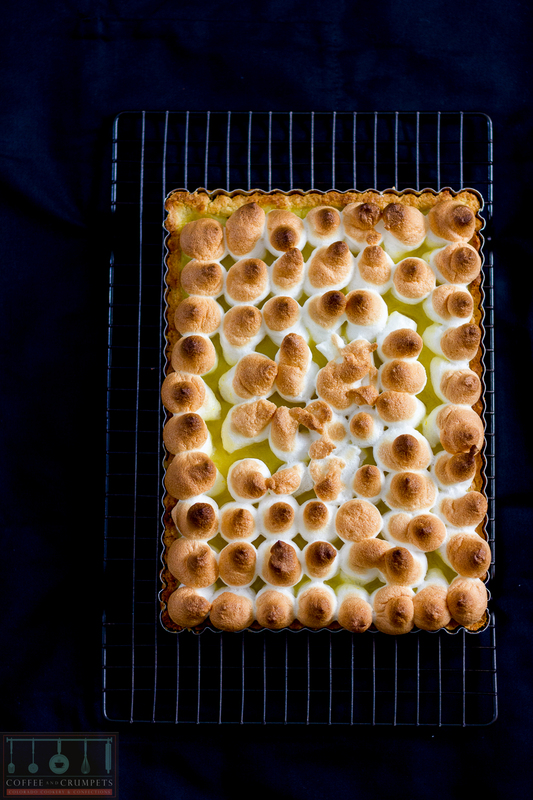 The tart looks delicious and the toasty meringue totally draws the eye to it and makes it so dramatic. Wow I’ve never heard of them! Doesn’t that make me a bad foodie? These look delicious, we have a couple of whole foods here all at least an hour away from me, but next time I go I’ll look out for them. I found mangosteins in there once and danced I was so happy. This looks fantastic. What a fab idea! Hi Holly! I did the Same jog you did when I saw these 🙂 They are hard to find outside of China and Japan. I heard people do have yuzu trees in California and so they and available on occasion over there. I have a huge Asian market close to me and they’ve never had these there so I knew when I saw them at WF that these could be a one time thing! Hope you can find some, I know they are very seasonal. Thank you Kiran, to you as well! This was my first time in yuzu as well, and I loved them! I will look for them every season now! What a beautiful and unusual tart. The textures and the flavors sound amazing! Thank you, mj! I found the yuzus to be so flavourful and fragrant. It made for a gorgeous tart! Oh my God, I am practically drooling here 🙂 … so lovely. I’ve seen this fruit in Sprouts here and I was thinking ” hmmm this looks strange”” hahahaha … ignorance my dear!!. Now I know exactly what to make with it.. waiting for more Yuzu recipes. Happy new year to you and to all your readers may this year bring joy, happiness, love,and peace to all of us. BTW I buy beef gelatin from Whole foods and sprouts, it is available at Amazon too.. just in case you wanted some. Thanks for the lovely recipe. Pinned. Thank you, Amira. You found these at Sprouts? I’ve never seen these at all until this year and only at Whole Foods. They are quite rare and hard to come by. I’m surprised your Sprouts had them. They are great though. If you like citrus then you’ll love these. There’s not much juice in them and you can’t really eat them but the zest is so fragrant that whatever you add it to, will just be incredibly aromatic. I loved them! What a gorgeous looking dish! I don’t believe I’ve ever had yuzu — I certainly haven’t cooked with it. Sounds interesting, though — I’ll have to search it out. Thanks for this, and Happy New Year! Thank you, John! Happy New Year to you as well. Hope you had a great holiday and enjoyed a few days off. I was surprised to find yuzu here myself so very excited when I got those babies home! Love trying new fruit! This looks so so so so good. If I ever get yuzu, I know what I’ll be making! Thank you Karishma! I hope you can get your hands on some, it’s such a wonderfully fragrant fruit! Thank you for stopping by ! Happy New Year my friend! I remember seeing Yuzu on a cooking show and then looking it up but have never come across Yuzu anywhere in Sydney. 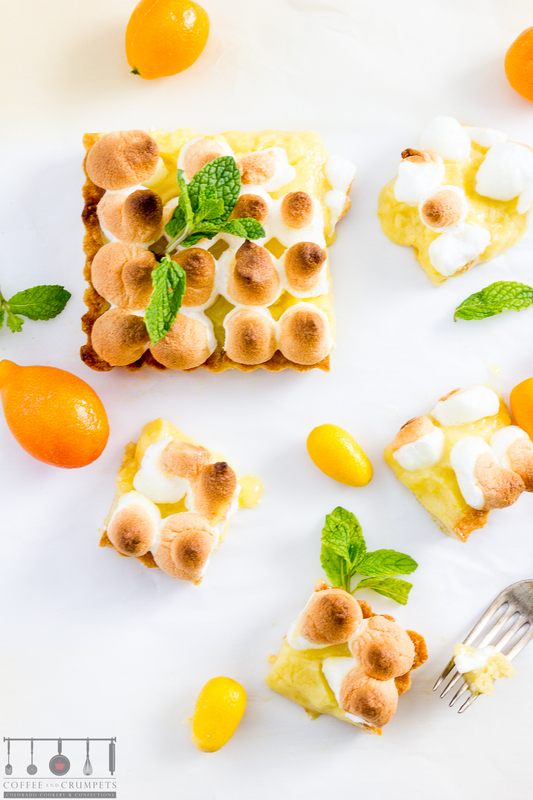 Citrus and Meringue and pastry…I don’t think i have to say that this is beyond fabulous. Out New Year;’s and Eve are so busy that sometimes I wish for quieter days. I can see the opposite happening as the boys grow up from your post. Hope you have an amazing year. Sending you heaps of love and hugs. PS: I also love your new blog design.. Stylish and neat! Thank you so much, my dear! Makes me feel really wonderful to read your kind words! I hope you had a great holiday and I wish you all the best for 2015! New Years for us is much like yours. Very low key. I don’t have the energy to go out and party anymore. This tart looks and sounds delicious. Yuzu isn’t very easy to find in Sydney so I’ve never cooked with it. Thank you, John! I’m hearing the same from everyone about finding yuzus in Sydney. I was very surprised to find yuzus here in my local health store. I have a very big Asian store close by and I’ve never seen them there so I was quite excited to find them at all! Thanks for stopping by! Happy New Year to you too! We had just returned from Florida on NY’s Eve, and so none of us were in the mood, or had the physical ability, to stay up until midnight. We were completely pooped, to say the least lol. Your tart sounds and looks fabulous! I’ve never come across this fruit, but it’s name does sound familiar. I’m so glad I stumbled upon your blog! You’ve got so many amazing recipes and pictures are gorgeous. Can’t wait to try this yuzu filling! And the meringue on top looks fantastic! I hadn’t heard of yuzu either Nazneen, thanks for introducing us to another citrus fruit! It sounds perfect for making curds and slices, seeing as it’s so tart and fragrant 🙂 Love the look of your pastry in particular, yum! Happy New Year to you and yours, Nazneen! Love that you started the new Year in such a sweet way, the tart is an absolute stunner. HNY Nazneen. What an excellent tart you’ve produced for us. I bought my sister some Yuzu juice last year, this pie would be the best place for it. Lemon meringue pies were everywhere when I was growing up. I never really loved them, but as I’ve grown up and started making my own, I appreciate really good ones. If I didn’t have a full Xmas cake to get stuck into, I might of thought about making one. Maybe next month. Thanks Charlie! Happy New Year to your lovely clan as well. Hope you can find some yuzus and try this tart, I think you’ll like it! It was really fragrant and flavourful. And quiet New Years is all I can handle these days. Nanzeen, I love it all. 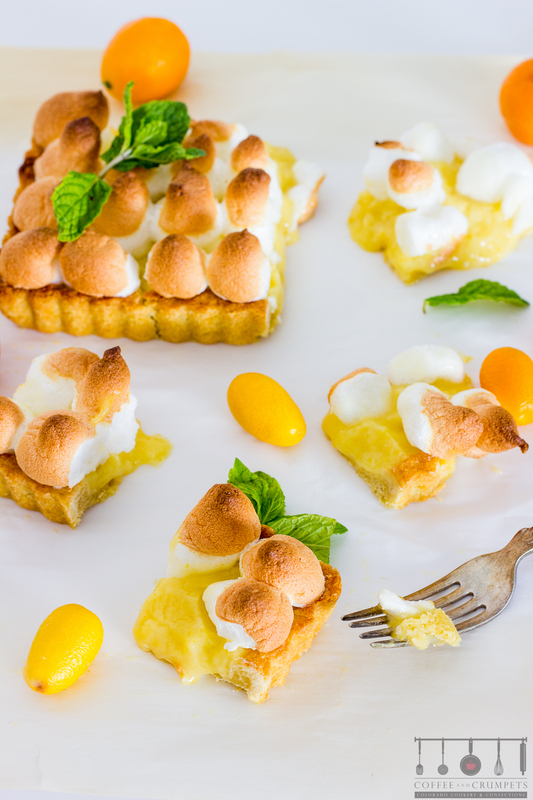 your new website design, this yuzu tart and your photography is drop dead gorgeous. Wishing you a super 2015 ! Sharing! Thank you so much, Bobbi! Happy New Year to you! Thank you, David! Happy New Year to you and Mark. Thank you so much for your support and for all your thoughtful comments. I appreciate your friendship. Woa – this is one delectable looking tart, Nazneen! What a treat to usher in the new year! You know, only after I had my daughter have I felt time go by so quick! Here’s hoping 2015 is wonderfulin every way for you and your family! Thank you, Shashi! Happy New Year to you and your lovely daughter. Kids and kids growing up really affect how we view ourselves and our age! I recently tried Einkorn flour, too. It’s hard to find in a package larger than 2 pounds, though. I can’t say definitively that I noticed a difference from “regular” flour. I should try it in a bread recipe, I think. things here in the mountains I would just do lemon! I heard that there is now a Whole Foods in Silverthorne, or maybe it’s Frisco? That is still a long drive for us. We go to the one in Basalt from time to time. Have a BLESSED New Year Nazneen!!! Wish you all a beautiful, healthy and happy New Year!! Wish your whole family a lovely year ahead. Nazneen, your pictures are stunning. THat first image is gorge, tart looks yum and amazing. About kids growing up too fast, I hear you lady. I’ve been in a crummy mood the last month too thinking about my teen leaving me for college in few years. Well, we all have to get prepared my darling. Thank you so much, Ash! Wishing all the best in 2015 to you and your family. Enjoy your time with the kids, they do grow up very quickly. I have never tried yuzu but after such a gorgeous tart, it will be next in my list. Love your decision to not post diet recipes but a dessert to celebrate the beginning of a new year. Happy New Year to you and your family, Nazneen! I never post diet recipes my first NY post! It seems silly, just eat in moderation!! Thank you, Denise! I too love citrus and am very excited to try to find some yuzu to play around with. This tart looks fabulous. I sure wish I had a bite or two! Thank you Karen! Check your Whole Foods, they may have some still. I think you’ll like this, especially if you like citrus. This is a stunner, Nazneen. And gorgeous clicks as well. Thank you so much Angie! Happy New Year to you as well! I need my sweets and this is just perfect!!! Like wise Julie! Happy New Year and thanks for all your support!